Just a couple of astronauts, out on the town. TWILIGHT, Zone (TWER)– Earlier today, Tommy Tuberville flew over the radar-screen cotton fields of West Texas en route to a new job and a new life in Lubbock, just like I did 16 months ago, a teary-eyed decision that cost me a press pass to SEC Media Days, inspired blog posts titled “Loveliest Village of the Llano Estacado” and the original “I Believe in Auburn… and Lubbock”… and which has apparently opened between the two cities what can only be described as a football program worm hole. I first noticed it right after I accepted my new newspaper job; ESPN’s Mark Schlabach predicted Texas Tech to meet Auburn in the Sugar Bowl. I had forgotten: Chris Todd – former Red Raider. And they still loved him out there. Give him time, they said. He’s good. But from 1,000 miles away, Todd looked like the guy who should have lost the starting quarterback job to the guy who was busy leading Texas Tech to their best season ever. 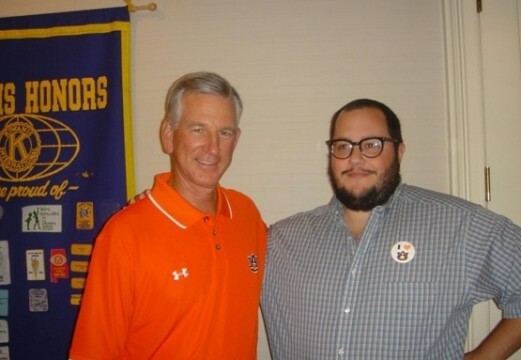 Todd looked like the guy who was leading Auburn to – of course – it’s worst season in a decade, a season that ended with (I couldn’t work for the rest of the day) Tommy Tuberville out of a job. The wind whipped into the cell phone. Ah yes… when that little rumor got goin’ — Mike Leach as a possible candidate to replace Tuberville — I started getting freaked out. I paced the newsroom, looking at my hands to see if they glowed, breathing on plants to see if they would wilt, and eavesdropping on the sports desk for updates. Personally, I think the line he laid on me last year at the Saugahatchee Country Club was a little more insightful. It was a week before I left and my third year in a row to see him speak to the Opelika Kiwanis Club. He started off with a joke and a gripe. We all laughed. It was a time of innocence. And there was a six game winning streak on. And other than the two-a-days fight club, which he seemed all about (“It’s good to see a foul mood in practice, and we’ve got some guys that are down right mean”), 2008 wasn’t 2008 yet. Hopes were still high. Tony Franklin was still getting high on Amy Winehouse and Tony Robbins in the Athletic complex. Chris Slaughter, he said, “will be a household name.” Vanderbilt was still vanquished. 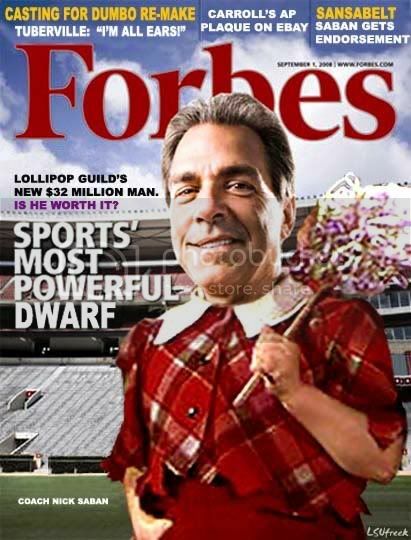 “Bama’s back” was still a punch line. But by the end, no one had set up the joke. No one had asked the question. Not just that – no one had asked anything about the Tide. Six wins is six wins, but the fires, I thought, must still be stoked. My heart started beating. It was moving my shirt. I raised my hand. I did my duty. There were a few snickers but not the guffaws I was hoping for. Tuberville looked down. He made a face. He looked up. He flashed the smile. Yes! Off the cuff! Coach! Coach! Coach! I went up to him after things settled down. I wanted a picture to remember him by. We lined up against the wall. We put our arms around each other. Ah… me, Dad, Susan taking the photo, Coach – we all laughed. Good times. It was the last time I saw him in person. And now, it’ll probably stay the last. 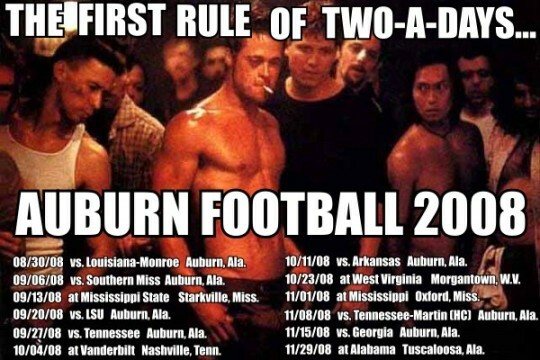 Sure – gone for more than a year now have been the chances for cameo pop-ins during my pre-Iron Bowl coffee grabbing with Housel (“Rammer Jammer, Coach. And I’d like you to meet Jeremy Henderson…”). But since returning to the Plains in August, there was still the fluttering you-never-know potential of seeing him in the rear view or of “War Eagles” in the checkout line. He was still here. He still rubbed elbows. He still lived around the corner from Dad. Until today. Until Texas Tech. Until Lubbock – the dark, treeless, brisket-eating, queso-dipping, dust storm side of the moon. Catch you on the flip side, Coach. Guns Up. And War Eagle. Photo by the great Susan Melton, Class of Awesome. My mom spent a couple weeks in Lubbock back in the 80’s working for the Air Force as a GC. She said there was nothing there but the base and the university…. and the cold weather. There’s always Praire dog Town, and Escondido Valley. i’ve driven through Lubbock while on tour. there is no reason to ever go there for anything. 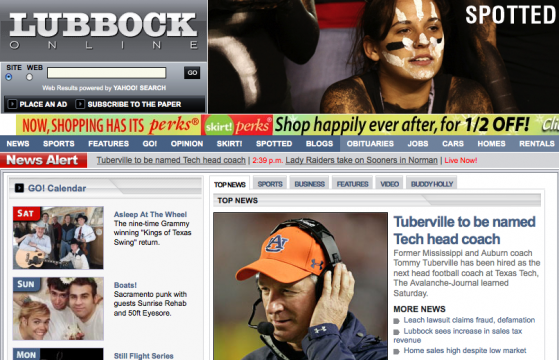 Tommy Tuberville to Texas Tech Two-Thousand Ten. Man, that’s a lot of T’s. This will give him something to do. Hope he does well and we can all move forward. 17 hours by car, 1,150 miles, Take 85 to Montgomery, 80 to Miss. line, 20 pass Dallas to 84 to Lubbock. Hope he does well. Praire dog town is different. Like the parks and real mexican food. Women’s basketball upsets #11 LSU! Can we get Nell Fortner to coach the men? Seriously. I never knew you were so tight with Coach Tubbs. It is pretty ironic that you and he have swapped places though. Glad you came back to God’s country! War Eagle!